Picture four stereotypical churches: (1) the Prosperity Gospel Church, urging you to name and claim whatever you pray for, yachts included; (2) the Civil Gospel Church, red, white, and blue-blooded, longing for a restored Christian America; (3) the Soup Kitchen Church, where the preferential option for the poor is always with us; and (4) the Immorality-Affirming Church, where “love wins” over doctrine every time (19–22). What do these four different churches have in common? According to Nick Roark and Robert Cline, they’re missing a solid grounding in biblical theology (101–11). It’s not that none of these churches believes the Bible, but that each in its own way misses the Bible’s main point. They each fail to grasp how the Bible’s 66 books present a unified story culminating in Jesus Christ, and how this unity helps us understand and apply all the parts properly. Roark, pastor of Franconia Baptist Church in Alexandria, Virginia, and Cline, managing director for the SBC’s International Mission Board, believe that biblical theology is an essential mark of a healthy church. Their new book, Biblical Theology: How the Church Faithfully Teaches the Gospel , is part of the 9Marks Building Healthy Churches series from Crossway, which consists of small hardbacks expounding each of Mark Dever’s Nine Marks of a Healthy Church (and a couple more). I’ll provide a brief summary before noting some strengths and minor weaknesses. Crossway (2018). 160 pp. $14.99. 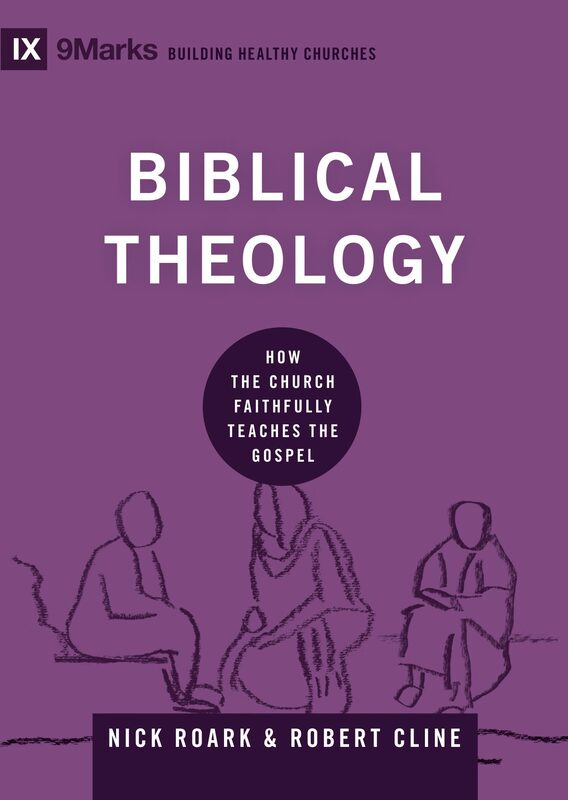 This brief book is about why biblical theology is needed, what it is, and how it shapes the church’s teaching and mission. In chapter 1, the need for biblical theology is illustrated by showing how each of the four churches mentioned above misses the Bible’s main point, and how biblical theology helps us keep the main thing the main thing. The authors are conscious, however, that they haven’t yet explained what biblical theology is (22). Biblical theology helps us understand the Bible as one big book with lots of little books that tell one big story. In chapter 5, Roark and Cline explain how biblical theology shapes the church’s teaching, guarding it against proof-texting (76–81) and moralism (81–88). Chapter 6 addresses how biblical theology shapes the church’s mission, particularly diagnosing the problems with the four churches mentioned at the beginning. The book closes with an appendix illustrating how to preach various texts in a biblical-theological way. On the one hand, longtime readers of biblical theology won’t find a lot of new information in this volume. Even its specific purpose isn’t totally unique, since Michael Lawrence wrote a similar book for 9Marks back in 2010 titled Biblical Theology in the Life of the Church. This book has the advantage over Lawrence’s of being more succinct and accessible for normal church members, which I suspect is what they were aiming for. If I wanted to disciple a group of high schoolers on the meaning and relevance of biblical theology for the local church, this would be the book to use. For pastors, I’d still recommend Lawrence. Ideally, I’d say read both. Chapter 5 is basically a mini-hermeneutics course, covering everything from Rahab’s scarlet cord to David’s five smooth stones, and could stand alone as a helpful primer on preaching Christ (though I’ll mention some reservations in a moment). Also useful in this regard is the appendix of case studies, which gives examples of how to preach specific texts (e.g. Prov. 2:1–6; Ps. 47:8) in a biblical-theological way. On the whole, I think the book is strongest when applying biblical theology to the church’s mission. Roark and Cline show us the dangers of over-realized eschatology in the Prosperity Church, the place of the church as new Israel in contrast to the Civil Gospel Church, the perils of downplaying eternal suffering in the Soup Kitchen Church, and the pitfalls of worldliness in the Immorality-Affirming Church (101–10). I especially appreciated their discussion of the church’s mission to make disciples when gathered and to be disciples when scattered (111–14). While such a brief discussion can’t answer all the sticky questions about what the church as an institution should be involved in, it does provide a good framework for answering them. I have no major faults to find with this book, just some reservations about some of the standard biblical-theological preaching tips contained in it. I suspect what I’m trying to describe is a feeling of familiarity bred by 15 years of reading books telling me how not to preach David and Goliath. To be fair, Roark and Cline are usually careful to nuance their statements. For example: “The point of the passage isn’t simply to highlight David’s courage” (81, emphasis mine). And, “It is true that David provides a positive example for believers” (82). These are balanced statements (though others are less so). But my fear is that such statements could easily get drowned out by the more relentless attack on character imitation as moralism. It’s not that I think the authors are tilting at a windmill. I know moralistic preaching is rampant in some circles, just not in mine. And perhaps that’s the source of my “redemptive-historical preaching” angst: maybe I’m just too sheltered. It could be these things are so ingrained in the preachers I listen to that hearing someone warn yet again about “being like David” seems like beating a dead horse, when the horse is actually alive and well in dryer pastures. It is one thing for a master of biblical theology to preach it week after week; quite another for a less talented follower so to do. We all know the old joke about the Christian fundamentalist who, when asked what was grey, furry, and lived in a tree, responded that “It sure sounds like a squirrel, but I know the answer to every question is ‘Jesus.’” One of the problems I have with a relentless diet of biblical-theological sermons from less talented (i.e., most of us) preachers is their boring mediocrity: contrived contortions of passages which are engaged in to produce the answer “Jesus” every week. It doesn’t matter what the text is; the sermon is always the same. I know this isn’t what Roark and Cline want. I’m also not sure it can be easily avoided unless we temper our zeal for biblical theology by supplementing it with other sources (like systematic theology, moral theology, and the church’s creedal heritage). I’d happily give this book to any preacher. I’d simply include it in a packet with books like John Carrick’s The Imperative of Preaching and Jason Hood’s Imitating God in Christ, which balance the biblical-theological perspective. So when it comes to preaching, this book (not surprisingly) shouldn’t stand alone. But of course in the end this isn’t a book mainly about preaching, but about biblical theology. And as a clear, compact treatment of that, it deserves to be read by all who want a better grasp of God’s Word.